Q: Why choose ECOLENE® fibers, not other similar synthetic fibers? A: Only ECOLENE® fibers that have a wide range of rich and vibrant color variations, as exhibited by our low density, rattan, wood, abaca and twistlene fibers. These ECOLENE® fibers also provide the best possible color consistency for each batch. This is a critical aspect for other buyers and manufacturers that seek to obtain the highest standard of product quality. Aside from that, we have a patent-pending technology called EcoTag that helps identify and authenticate every ECOLENE® fiber. Q: Can I use ECOLENE® products all year long and in all weather conditions? A: Definitely.ECOLENE® products are specifically designed to be used in all weather conditions. These products are engineered to tolerate extreme temperature levels, ranging from – 70° Celsius to 70° Celsius. In addition, ECOLENE® fibers are randomly tested every three months by independent testing laboratories to assess their UV stability and consistency with the existing international standards using the best methods around. Q: Will the color of ECOLENE® fibers fade over time? A: If ECOLENE® fibers are exposed to harsh summer sun winter weather; the colors of our fibers will not fade or degrade. Q: What are the physical properties of ECOLENE® fibers? A: All ECOLENE® fibers have undergone rigorous global quality control testing procedures, conducted by external independent testing laboratories. This proves that ECOLENE® fibers have the matchless strength that can help these fibers endure the harshest weather conditions possible for three years. Q: How can I differentiate ECOLENE® fibers from other similar fibers? A: You can easily distinguish the difference between ECOLENE® fibers and other similar fibers through a patent-pending technology called EcoTag. By using a special device and method, we can identify and authenticate the presence of a unique UV (ultra violet) protection additive in every ECOLENE® fiber. This certainly helps prevent product counterfeiting, because only ECOLENE® products that can be identified and authenticated. Q: Are ECOLENE® fibers safe for the environment? A: ECOLENE® fibers are made from raw polyethylene that has undeniable 100% recyclable quality. We use organic and eco-friendly inorganic colorants. Therefore, ECOLENE® fibers are free from harmful heavy metal substances such as Cadmium, Lead, and Chromium that are commonly used by other manufacturers. Q: Is there any other supporting fact which can validate that ECOLENE® fibers are environmentally safe? 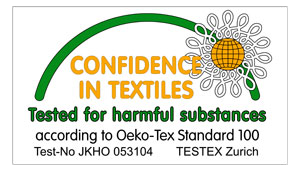 A: Yes, there is.ECOLENE® fibers are free from harmful substances and meet the human-ecological requirements of the international standard presently established, as validated by Oeko-Tex Standard 100 Certificate from Switzerland. Q: How do ECOLENE® fibers stand up to daily wear and tear? A: ECOLENE® fibers are engineered to be superbly resistant to rain, salt, chlorine, lotion, and alcohol. This certainly makes the fibers compatible to be used in our daily life. Q: Do ECOLENE® products need a special maintenance procedure? A: No special maintenance procedure is required. Just simply wipe the surface clean by using a damp piece of cloth. A quick wash with mild detergent every three months is also recommended. Q: Do all ECOLENE® products come with a warranty? A: Yes. All ECOLENE® products come with a 3-year warranty, which is effective starting from the date of the purchase. The warranty covers all mechanical and physical properties of ECOLENE® products.